Miles and miles from home, the Hatters sealed promotion back into League One with a 1-1 draw at Carlisle United on Saturday. 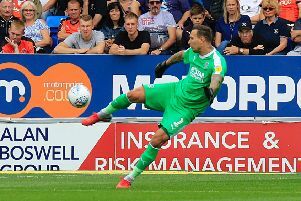 Nathan Jones’ side approached the game knowing that victory would be enough to secure their place in the third tier of English football for the first time since the 2007-08 campaign when they were relegated after being deducted 10 points by the FA. They looked like they would make hard work of it at the weekend, as Danny Grainger put the Cumbrians ahead in the 13th minute, netting a penalty after James Shea had brought down Richie Bennett. With Exeter turning round a one goal deficit to lead Crawley Town 2-1, it had appeared Luton would have to wait another week to complete the job. However, that all changed after 62 minutes as Danny Hylton’s shot was parried by United keeper Sam Bonham, only for Olly Lee to arrive at the back post and make it 1-1. Before Town’s travelling army of nearly 1,500 fans had stopped celebrating, news filtered through of the Red Devils levelling at St James Park, meaning that if matters stayed the same, Luton would be promoted. That they did, with a huge roar erupting from the away end as Exeter drew 2-2, leaving Town with just five minutes to ensure promotion. They managed that without any real alarm as the final whistle was greeted with superb scenes of celebration from Jones and his players, who could finally lay to rest the bitter disappointment of the previous campaign, when they were cruelly knocked out of the play-offs by Blackpool. News/Gazette photographer Liam Smith was on hand to capture all of the celebrations, so check out the gallery for all the best pictures.